In keeping with Marriott Hotels & Resorts' global redesign of the traditional hotel lobby, the lobby of this hotel by Towson University has taken on the identity of a social hub, allowing guests to mingle, work and lounge. TOWSON, MD--(Marketwire - Nov 1, 2012) - The Towson University Marriott Conference Hotel, already a leader in the field of extended-stay lodging in Baltimore, completed a multi-million dollar renovation in April of this year. The transformed hotel rethinks what the modern traveler looks for when choosing an accommodation offering updated guest rooms and suites, new event space and an innovative lobby which acts as a social hub. By incorporating flexible space in all areas, the entire hotel is able to take on the multi-faceted needs of all guests -- from business executives to event planners and families. "With the revitalized spaces we are taking an enthusiastic approach at creating a gathering place. Here, guests can tailor their use of the spaces to fit their own needs. It makes our hotel more like a modern living space, more like home," explains David Hinshaw, General Manager of the Towson University Marriott Conference Hotel. "Our goal is to remove boundaries and make our hotel more engaging and beneficial to our guests." 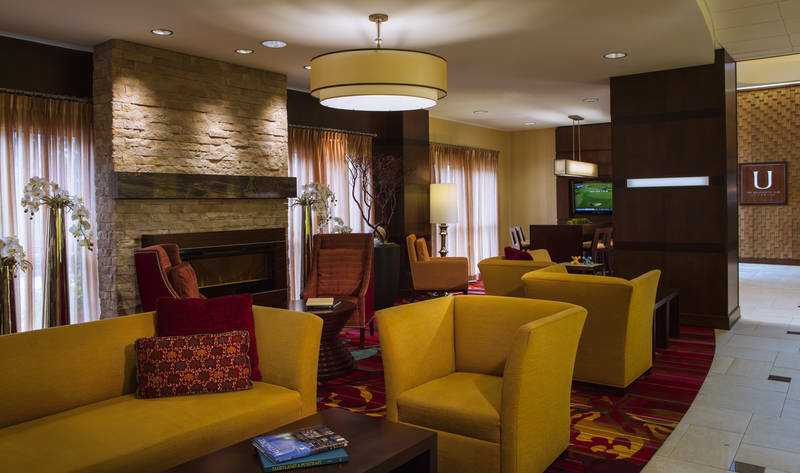 In keeping with Marriott Hotels & Resorts' global redesign of the traditional hotel lobby, the lobby of this hotel by Towson University has taken on the identity of a social hub, allowing guests to mingle, work and lounge. As a part of the hotel's recent re-imagination, the hotel also welcomed the addition of a new social event space, converting rarely used space into more than 2,800 square feet of social event space featuring soft seating, modern décor and an expansive terrace. This casual yet upscale event space provides the perfect venue for cocktail receptions, intimate parties and social gatherings. This addition presents over 14,000 square feet of total event space, offering 19 meeting rooms; each refreshed with new carpeting, wall vinyl and window treatments. The two newly retrofitted board rooms provide state-of-the-art technology with large flat panel televisions, multi-media connectivity panels and conference call capabilities. All rooms have enhanced Wi-Fi capabilities with most enjoying natural light. In fitting with the needs and desires of today's meeting planners, the hotel accommodates all -- a casual gathering place to connect; a centralized location for groups to meet, interact, and work; a place for family and friends to come together in celebration. Each of these experiences exists distinctively within the property. Towson University Marriott Conference Hotel's comfortable all-suite accommodations, great service, and wide range of facilities and amenities offer a relaxing and tranquil environment perfect for extended stays, weekend getaways, and business or leisure travel. The hotel is also an expert when it comes to Towson, Maryland, weddings. The hotel features 191 suites, including a Concierge Level; one of the best restaurants in Towson, the University Club at Towson; and over 14,000 square feet of meeting space, with 19 meeting rooms. The hotel offers free covered parking and free Wi-Fi in common areas and guestrooms. Guests also have access to a 24-hour fitness center, 4 golf courses within 10 miles, and jogging, walking & bike trails on the campus of Towson University adjacent to hotel. Towson University Marriott Conference Hotel is walking distance to the region's most upscale shopping at Towson Town Center Mall, and many other shops, boutique s and restaurants in the area. The hotel is easily accessible from BWI airport, Baltimore city, Washington, DC, Dover DE and Philadelphia, PA. Baltimore's Inner Harbor is 12 miles away. For more information or to make reservations, contact your travel professional, call the hotel directly at 410-324-8100, or visit www.TowsonUniversityMarriott.com.